Click here to read an article from the Daily Reporter highlighting their story. Often, small companies will be hesitant to even start a dialog or consider acquiring their competition to jumpstart growth. It’s just too intimidating. Owners are afraid of revealing too much, or of the seeming complexity and risk. Radon Be Gone (RGB), a radon inspection service in Columbus, has owners that sought quick growth while reducing the time crunch they were constantly under. 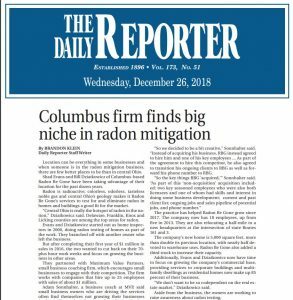 Check out Columbus’ Daily Reporter’s front page coverage of RGB’s purchase of a competitor. MVP often guides its clients, such as RGB, through an almost counterintuitive purchase strategy that is un-complicated, seamless and less costly. Using a “non-acquisition acquisition” strategy, the client simply hires the staff of the other firm and only “purchases” necessary soft assets such as customer lists without actually buying the company. Radon Be Gone’s owners, Shad Evans and Bill Dziatkowicz have achieved their objective of eliminating 70+ hour work weeks, delegating field work to others and adding business development staff for growth. Shad and Bill were struggling with finding good people who could help relieve them of some of their duties and position RBG for further growth. Their successful “non-acquisition, acquisition” of a competitor caught the attention of The Daily Reporter because it led RGB to tripling staff size in four years, relocating to a new location with twice as much space, and significant revenue growth in new market segments. MVP helped RGB evaluate potential acquisitions / competitors while coaching Bill and Shad through approach strategies. MVP reviewed one target company and concluded that the owners were too unreasonable in what they wanted in order to consummate a transaction. With MVP’s guidance, RGB got a bit creative. Instead of acquiring his business, RBG agreed to hire him and one of his key employees. As part of the agreement the seller transitioned his ongoing clients to RBG and phone numbers were forwarded to Shad & Bill. So, the key things RBG “acquired” as part of this “non-acquisition, acquisition included: i) two key seasoned employees who were also both licensees — one of whom had skills and interest in doing business development, ii) current and past client lists, iii) ongoing jobs and sales pipeline of potential jobs, and iv) a phone number. From RBG’s standpoint, these were the key assets they were interested in acquiring so MVP dubbed it a “non-acquisition” acquisition!